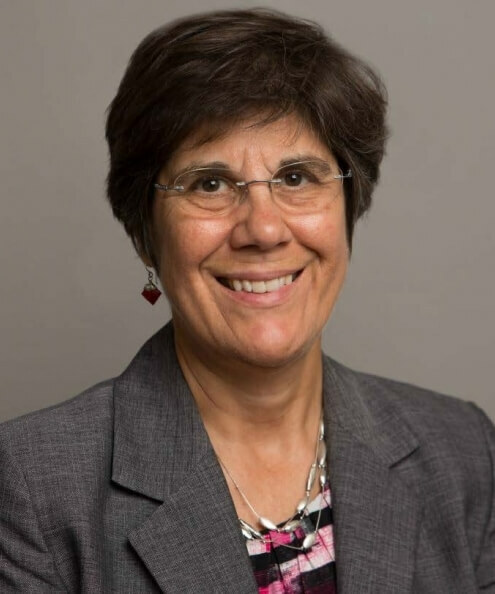 Ruth MacDonald is professor and chair in the Department of Food Science and Human Nutrition and interim senior associate dean for the College of Agriculture and Life Sciences at Iowa State University. She holds a doctorate in nutrition, minor in food science, and master's degree in nutrition with a minor in physiology from the University of Minnesota. She is also a registered dietitian. She was a post-doctoral fellow at Harvard Medical School Joslin Diabetes Center for two years. She was on the faculty at the University of Missouri for 17 years, rising through the ranks from assistant to full professor prior to relocating to Iowa State University. Her research interests include the role of dietary factors in cancer progression, specifically breast, colon and prostate cancer. Using mouse and cell culture models, she explored the ability of selected dietary botanical supplements and phytoestrogens to alter cancer cell development, and she characterized their cellular mode of action. She identified a role for estrogen receptors in colon cancer risk. This work was funded in part by the National Institutes of Health-sponsored University of Missouri Botanical Center, the U.S. Department of Agriculture and the American Institute for Cancer Research. In other work funded by the U.S. Department of Agriculture, she studied the cellular role of zinc in regulation of growth and food intake. While at the University of Missouri, she taught courses in nutritional biochemistry, sports nutrition and food science. At Iowa State University, MacDonald teaches a graduate course in nutritional oncology and an undergraduate course in food systems. With funding from the U.S. Department of Agriculture, she leads the Cyclone scholars program that provides tuition scholarships to underrepresented minority students. She gives frequent public presentations on the science and safety of biotechnology use in food, and she is a scientific expert for GMO Answers and Best Food Facts. MacDonald is a 2014 graduate of the Food Systems Leadership Institute. She is a professional member of the Institute of Food Technologists, the American Society for Nutrition and the American Association for Cancer Research. She has served on editorial boards for the Journal of Nutrition, Journal of Nutritional Biochemistry, Nutrition Research and Korean Journal of Nutrition. She has been a member of the executive board for the nutrition division of the Institute of Food Technologists and currently serves on the IFT higher education review board. She has served on grant review panels for the National Institutes of Health, U.S. Department Agriculture, U.S. Department of Defense and Komen Foundation. She has served on the state of Iowa economic development board and the technology and commercialization committee. MacDonald has traveled extensively, including as a faculty leader for the Dean’s Leadership Program in Rome that engages Iowa State University students with researchers at the United Nations Food and Agriculture Organization. She co-authored a textbook, "Understanding Food Systems: Agriculture, Food Science and Nutrition in the United States" (Elsevier, 2017).